Batman's characters have been pretty well represented on-screen over the years, and yet Batman's most long-standing adversary, the Joker, has never had his own solo flick. But there's one very good reason it hasn't happened yet — and it's the same reason we hope it never does. Seeing the other side of those plans, however, would be precisely the problem. When the Joker is just a character or foil in another character's narrative — whether we're talking Batman or Harley Quinn — those holes in his backstory and the empty spaces around just how he manages to accomplish his insane schemes actually strengthen the plot. 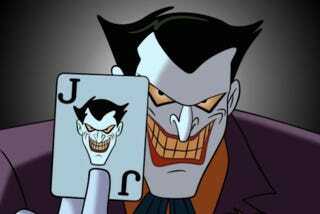 The Joker is a chaos character, and both the improbability of the plans and the lack of any sort of background explanation underlines that. But when he's suddenly the central focus of the plot (and not just as part of an ensemble like in the forthcoming Suicide Squad movie), not only does his story necessarily become much more linear, but having how he accomplishes his plans being swept aside with a shadowy hand-wave is suddenly unsatisfying: A Joker movie would need to show and tell us just how he's managing to carry out his usually absurdly elaborate plots. It's no longer enough to simply know that the Joker has trapped Batman on a giant roulette wheel, rigged with explosives (yes, a real Batman plot point). Now we have to see how it happens. Perhaps he does all the wiring himself. Perhaps he spent hours dreaming up possible gag Batman attack scenarios and pre-assembled all of them, just in case. Or, perhaps he just screened his henchmen very carefully for an attention to mechanical detail with some kind of pre-employment personality test. Either way, a movie about the Joker would, essentially, be a movie about a sprawling one-man bureaucracy. And that's a movie no one wants to see.